Two victims, youth and soldier, lightly wounded by terrorist at Gush Etzion Junction in Judea; terrorist eliminated. A car attack took place at the Gush Etzion Junction in Judea on Tuesday afternoon. Two victims, one identified as a Jewish youth and the other as an IDF soldier, were lightly wounded after being run over by the terrorist, who was then eliminated. The terrorist was driving from the direction of Hevron on the highway towards Jerusalem. After exiting the vehicle with a knife, he was shot by soldiers posted at the junction. Magen David Adom (MDA) medics arrived at the site to provide medical treatment to the wounded, who were then evacuated to a hospital in Jerusalem. 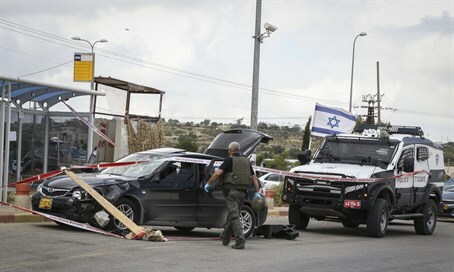 The roads leading to Gush Etzion Junction were closed following the attack. The attack comes just a few hours after 55-year-old Avraham Hasno of Kiryat Arba in Judea was killed in a rock ambush attack. Arab terrorists threw rocks at several cars at Al Fawar junction, southwest of Hevron, prompting Hasno to get out of his car, at which point an Arab driver ran him over in a truck before fleeing the scene. That attack was itself preceded shortly by an attack on a soldier in Hevron, who was stabbed by an Arab terrorist and lightly to moderately wounded while patrolling near the Hevron Hills village of Beit Awwa. His attacker was shot dead by soldiers.